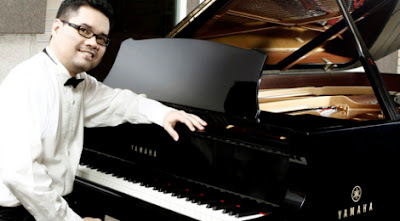 Info Musik- The Maestro who was hailed by Sydney Morning Herald as "One of the world's leading pianists and has been at the forefront of championing new piano music" is invited by Aula Simfonia Jakarta to perform his works that have brought Indonesia to the prominent stages of the world : Rapsodia Nusantara. Those Rapsodias are based on Indonesian folksongs and composed brilliantly for the pianist, and they offer new perspectives on the virtuosity of piano playing. At this concert the Maestro will perform live, for the first time, his newest Rapsodia Nusantara no. 10 based on the Balinese song JANGER. Ananda Sukarlan will also perform some of his lighter and most popular pieces for piano, such as his collection of Love Songs (Falling in Love, Differences Unite etc), Lonely Child, Sunset Modulations etc. This concert will also pay a tribute to pianist Henoch Kristianto, whose CD of Ananda Sukarlan's Rapsodia Nusantara and other various piano pieces has been released a few weeks ago. A CD which Ananda himself said : "Henoch didn't play my Rapsodia Nusantara pieces as I imagined how they should sound. He plays them BETTER than I imagined them. He managed to paint new colours, squeeze different nuances from different pianistic textures and see them from different points of view which I myself haven't seen before." But don't miss this unique opportunity of Ananda Sukarlan's brilliant piano works played by the composer himself ! Come and witness this historical musical event on Sunday, October 20th at 4.30 p.m., at the beautiful Aula Simfonia Jakarta. Tickets: Platinum Rp. 1.000.000 (limited to 30 seats, and incl. a free gift of Rapsodia Nusantara CD and cocktails with The Maestro before the concert).